"The world's masters of murder pull out all the stops to destroy Agent 007!" The terrorist organization known as SPECTRE is plotting revenge against British agent James Bond. They are also looking to steal from the Soviet Union and sell it back to them. In order to accomplish these objectives, SPECTRE recruits an assassin named Donald Grant along with a Soviet clerk named Tatiana Romanova. Bond goes to Istanbul Turkey to meet with a man named Ali Kerim Bey. When Bond gets there he is followed by Grant. One night Bond and Kerim Bey are attacked at a gypsy rally. Kerim Bey is wounded while Bond almost gets murdered. Later that night, Bond goes to his hotel and meets Romanova waiting for him. SPECTRE has this filmed and begin to spy on Bond. James Bond plans to steal the Lektor device and leave Turkey. He uses floor plans provided by Kerim Bey to help pan the theft. The theft is a success and Bond, Romanova and Kerim Bey escape by train. However they are still followed by Grant who kills Kerim Bey. On the train Bond is attacked by Grant but eventually murders him in a struggle. In the end, members of SPECTRE chase Bond and Romanova but Bond is able to kill off the pursuers. One of the leaders of SPECTRE named Kronsteen finds Bond and Romanova at a hotel and tries to murder Bond. However Romanova saves him by murdering Kronsteen by gunshot. Bond and Romanova then ride off in a boat. 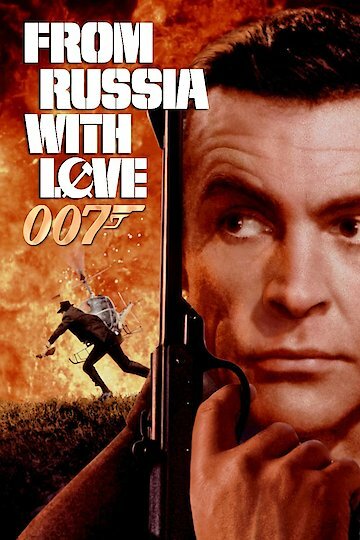 From Russia with Love is currently available to watch and stream, download, buy on demand at Amazon Prime, Netflix, Amazon, Vudu, FandangoNow, iTunes, YouTube VOD online.